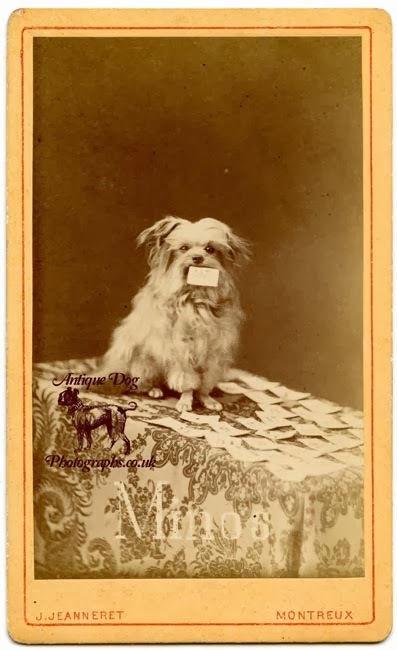 In Switzerland, c1875 a very special little dog had his photograph taken. His name was Minos and he belonged to Madame Hager. 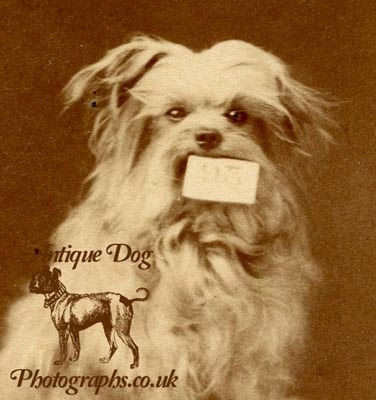 I could write at length about this little dog, but he is best summed up by detailed descriptions of him that appeared is newspapers of the time - from Spectator in London to as far afield as Christchurch, New Zealand's Star. "Minos" is like a Skye of the long-haired, silky kind, only that he turns his little feathered fore-paws out in an odd way, which reminds one of the hands of certain lecturers when they are emphatic ; his large brown eyes are inquiring, serious, and closely attentive ; his little black nose twitches with a variety of expressions very curious to observe, as the several problems of his arithmetical examination are presented to him ; and to see him lift his head with a sharp air of questioning, and slightly shake it when be has been answered to his satisfaction, is the prettiest and quaintest sight possible. He was deposited on a large table by his mistress, and mildly regarded so many of the company as were within easy reach, but he betrayed no vulgar curiosity, while he waited until Madame Hager's preparations were complete. She conversed with him cheerfully, as she arranged a number of cards bearing the numerals 1, 2, 3, and so on, and several double figures. With a gentle shake of one paw, the little creature began his "exercises." 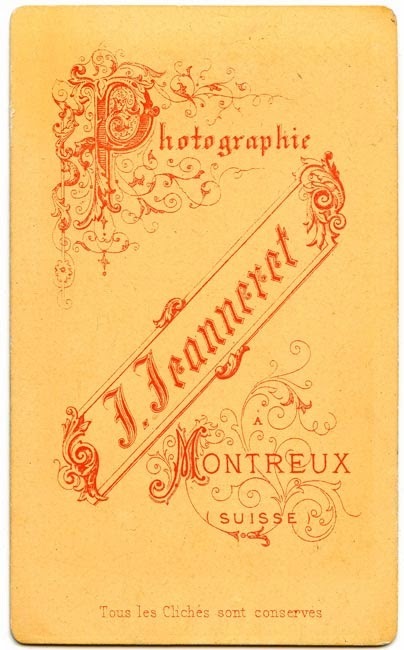 He picked out a dozen cards in succession, named by various persons among the audience, the number being distinctly repeated to him by his mistress, and then she asked any one present to name a sum in addition which "Minos," who had just brought the card marked 6 in his mouth to her, should work. A lady said, "Let him add 12 to it." " Ajoute dome, 'Minos,' cherche, apporte !" 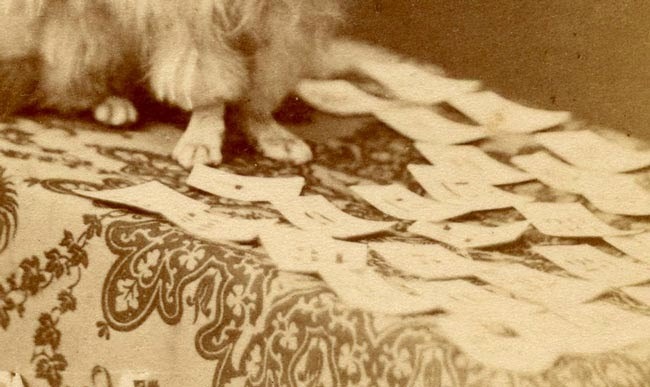 He gave his mistress a long look, twitched his nose, ambled gently over the spread cards, without displacing them, and presently returned, carrying in his mouth the card marked 18. Every one wanted to know "how it was done," few were contented to receive Madame Hager's assurance that the feat is entirely one of memory, when "Minos" picks out an individual among the royal and princely personages of Europe (he even crosses the Line in favour of the Seyyid of Zanzibar) at the re- quest of any member of the audience. A favourite theory was that Madame Hager conveyed an indication to him by changes of voice in repeating the name after the chance nominator. But even if it were so, that would be a more surprising exercise of memory, because it would require its employment on count- less inflexions of one voice, and the connection of them with the pictures, of which he is said to recognise four hundred. He picked out twenty-five without any difficulty, and when the titles of the Queen of England and the Princess of Wales were changed to "the august mama" and the "august wife" of the Prince of Wales (who is a special patron of "Minos ;" indeed, he came to London at the express invitation of His Royal Highness), he found the portraits just as readily. The spectacle was a charming one, not only because of the extraordinary sagacity and memory of the little performer, but because of something exquisitely gentle, trustful, and loving in his look and movements which went to people's hearts. 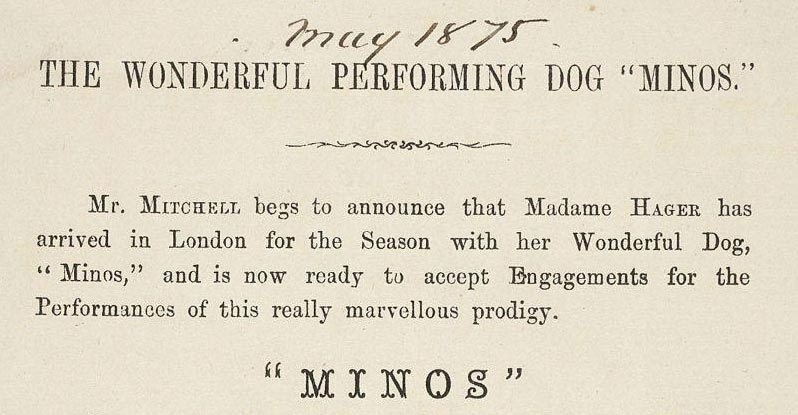 Minos was born in Vienna in 1870, the weakest of three pups he was adopted by Madame Hager's only daughter Marie. She had a strong affinity for animals, and a peculiar talent for teaching dogs. He first tecnique was to perpetually talk to them, and she adopted it at once with Minos. From the very moment Marie took Minos under her wing it is said "she had no companion except the dog ; he was her doll, her play- fellow, her confidant ; she talked to him incessantly, and about everything ; she showed him everything, she took him everywhere ; her friends were his friends ; she educated him to his present pitch of erudition, and taught him one accomplishment which he has since lost, or perhaps declines to practise (who can tell the mystery of the doggish heart?)" Sadly Marie died of consumption. The despair of the dog when the girl's coffin was removed was terrible. He had not left her side for a moment, and no one had the heart to take him away, when, after desperate efforts to warm and waken her, he lay down by her, moaning, and cried himself to sleep. After a while, he came to love the girl's mother with something of the same intensity ; but it is an added, not a transferred, affection. So many people ask me, What is your secret?' I have no secret, except that I love dogs, and they love me. Minos' never leaves me ; I tell him everything I think and feel, all joys and all troubles ; he knows my thoughts ; we are only two, in England, and I never hurt him by keeping silence. He never rehearses ; it is needless. He has no fear of any one or anything, for he never had a harsh word spoken or a finger raised to him in his life. There's no secret, except the truth that men will not see ; that you can do anything with a dog, if you only make him the friend and companion he wants to be.